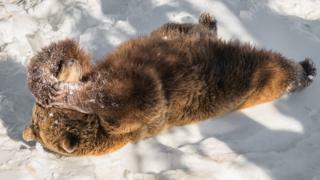 Researchers have discovered seasonal changes in the gut microbes of brown bears, which apparently help the beasts cope with the demands of hibernation. Bears feast and gain weight in the warm months, ready for the big winter doze. In faecal samples from 16 wild bears, scientists found a bug population that was more suited to depositing fat in summer, and burning it in winter. And when transplanted into lab mice, the "summer" bacteria caused greater fat gain than the "winter" ones. Senior author Fredrik Bäckhed, from the University of Gothenburg in Sweden, said it was not a huge surprise to see gut flora change with the seasons - but this is the first time anyone has revealed a role for these different bugs in the energy metabolism of a hibernating animal. "We know that the microbiota is very responsive to what we eat," he told BBC News. "So if a bear eats a lot in the summer and it doesn't eat in the winter, then there should be an altered microbiota. What we learn from our study is that it appears that the altered microbiome can contribute to the altered adiposity (fattiness)." Despite this insight, Prof Bäckhed said his team's findings were not going to help tackle human obesity. "I don't think that this study will have direct implications for obesity, as the summer microbiota will make you fat and the winter insulin resistant. "But perhaps we can find clues for treating malnutrition from the summer bacteria, and help patients with anorexic disorders - including cancer patients." To collect the samples, the researchers worked with the team from the Scandinavian Brown Bear Research Project, who specialise in monitoring the creatures in the wild. And specialist expertise was required; it is no small undertaking to wake up a hibernating bear and take a sample of its faeces. "They go out in the forest in the winter, they identify a bear den and then they shoot it with a tranquiliser to get some samples," Prof Bäckhed said. "Then they put on a radio collar, and release the bear so it goes back to sleep and wakes up in the spring." The radio collars were critical, he added, because it allowed the team to track down the same bears in the summer and compare the seasonal stomach bacteria of individual animals. As well as discovering obvious changes in each bear's roster of bacterial species - which were similar to shifts already seen in studies of squirrels and hamsters - the researchers tested the effect of the bugs in "germ-free" mice. "These are mice that are born and raised in a bubble, where they have never been exposed to any bacteria," Prof Bäckhed explained. So when researchers transfer foreign microbes into the mice, they know that introduced bugs are the only ones present. "What we found was that if we colonised the mice with the summer bear microbiota, the mice gained more adiposity compared to if the mouse was colonised with faeces from the same bear in the winter." Strikingly, just like the bears themselves when they fatten up every year, the mice with summer-bear bacteria remained "metabolically healthy". "Although they gained more fat mass, it didn't impair their glucose tolerance," said Prof Bäckhed. In other words the insulin system, which regulates the body's use of blood sugar and causes diabetes if it goes haywire, was still in working order. The bugs in the belly of a bear, then, appear to be part of the reason why these large animals can get even larger on an annual basis - without suffering in the way that humans do if we indulge our own predilection for a prolonged, winter-time feast.